"This is bruschetta with a twist on the standard. It looks great for entertaining and is tasty and easy to make. Looks and tastes like restaurant quality." For the hummus, place the drained garbanzos, lemon juice, garlic, cumin, and olive oil in a food processor. Process until blended, about 1 minute. Refrigerate overnight. Bring to room temperature before making the bruschetta. Spread a teaspoon of butter on each slice of ciabatta; sprinkle with a teaspoon of Parmesan cheese. Place under broiler until slices are golden, about 3 minutes. Remove from oven and spread with a generous tablespoon of hummus. Sprinkle with a dusting of paprika. To serve, top with tomato slices, feta cheese, and a sprinkle of the oregano and garlic powder. 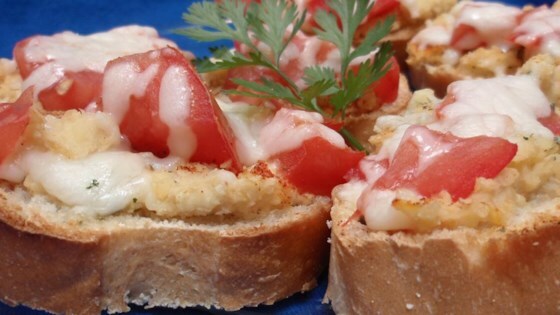 Make this easy, flavorful bruschetta appetizer. I always take this to parties. It's a hit every time!! Super yummy. GREAT! used store bought hummus that i already had in the house & needed to use up. PERFECT!